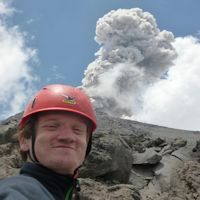 Oliver Lamb is a PhD student in the Volcanology research group in the University’s School of Environmental Sciences. “Volcanoes are a spectacular and dangerous embodiment of the dynamic nature of our planet. An estimated 800 million people now live within 100 km of an active volcano around the world, and this figure continues to increase every year. Furthermore, the atmospheric spreading of ash from prolonged eruptions can bring widespread disruption to air travel on a continental scale; something highlighted by the 2010 eruption of Eyjafjallajökull in Iceland. It is clear that the need for a better understanding of volcanoes and their behaviour is as great as ever. Volcanoes are complex beasts: no two volcanoes behave exactly the same. Indeed, a single volcano might display completely different eruptive behaviour within a human lifetime. This presents a huge challenge for scientists responsible for monitoring volcanoes around the world. While we may be able to detect the signs that magma is rising inside a volcano, there are still no reliable means for determining whether the magma will reach the surface, and if it does, how violent and prolonged the eruption will be. One of the key methods for monitoring volcanoes is to detect small earthquakes that occur within the volcano. Volcanic earthquakes are as complex as the volcanoes themselves, in that they come in a variety of shapes and sizes; a direct reflection of their wide range of different sources. As magma pushes its way towards the surface, it can induce the cracking and faulting of rocks around it. Closer to the surface, hydrothermal fluids moving away from the magma can themselves induce small shocks by cracking open the rocks. Inside the conduit which feeds magma towards the surface, molten magma can, in the right conditions, break like glass to induce yet more earthquakes. On top of that, we can also detect earthquakes from surface processes such as explosions, rockfalls, and fast-moving pyroclastic density currents. What is clear is that the complexity of volcanic earthquakes can make it difficult to interpret the signals recorded at an active volcano. My PhD is part of a bigger interdisciplinary effort funded by the European Research Council to achieve a better perception of how magma behaves under certain conditions and what this means for volcanic eruptions. In my project, I have looked at earthquake data from a number of different volcanoes across the globe. Using data from Unzen volcano in Japan, which erupted in the early 1990s, I was able to link two groups of repeating volcanic earthquakes to the eruption of a spine of hardened, stiff lava. Additionally, this data was also used alongside experimental data compiled by a fellow postgraduate colleague to illustrate the complex frictional behaviour occurring on the margin of the spine. This work has now been published across two articles in international scientific journals. 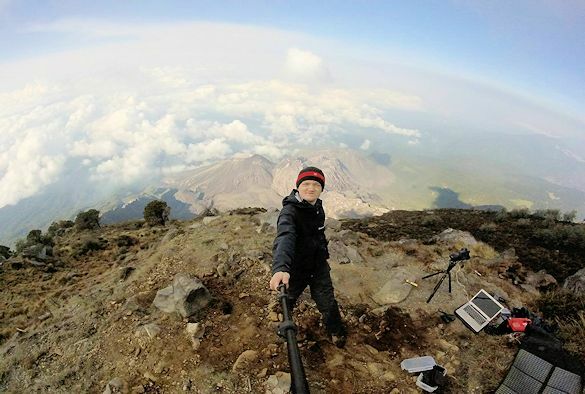 My next step was to look at data from Volcán de Colima in Mexico, one of the most active volcanoes in the world. By combining the seismic data with that from experiments conducted in Liverpool, I have demonstrated the potential of combining these two scientific approaches for understanding processes occurring inside an active volcano. This research will now be submitted for review and publication in a scientific journal in the near future. During the remainder of my PhD, I will be looking at data collected from Santiaguito volcano in Guatemala, another of the most active volcanoes on the planet. I consider myself a very lucky person to be working on this project in Liverpool which is one of the most innovative and interdisciplinary volcanology research groups in Europe. It has given me the chance to explore some of the most beautiful places in the world, including fieldwork to the volcanoes in Mexico and Guatemala. I have also been fortunate to attend and present at several conferences and workshops within the UK and abroad, including in Iceland and Austria. These events gave me the chance to meet and interact with many other scientists from around the world, as well as begin collaborations that I hope will lead to ground-breaking research. You can read more about Oliver’s research at his personal website (oliverlamb.weebly.com) and his blog (crackingvolcanoes.blogspot.co.uk). Visit the study pages to find out more about studying earth sciences at Liverpool. Visit the research pages to find out about Liverpool’s research and expertise in volcanology.